These 2008, 2009 and 2010 AFLAC Bowman Rookie Cards were distributed by Topps in very limited quantities exclusively at the AFLAC All American High School Classic Game. All cards are in NrMt-Mt or better condition unless otherwise noted. We cannot guarantee any specific grade from any specific grading company. 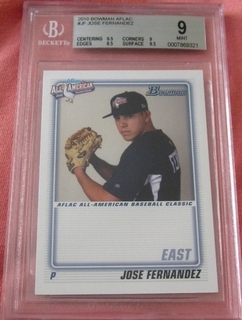 Featured at right is a Jose Fernandez 2010 AFLAC Bowman Rookie Card graded BGS 9 (MINT).